It was one of those perfect summer evenings. 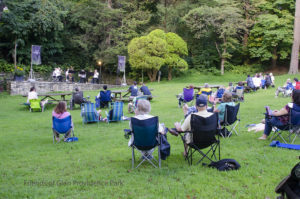 One that called for being outside to revel in a perfect late summer evening, and the stage at Glen Providence Park once again provided the entertainment to complement the mood. 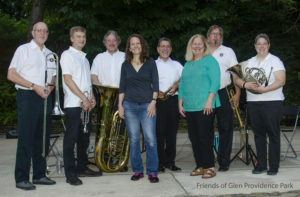 The clear, bright sound of the Delco Symphony Brass Quintet wrapped around the Glen on August 25, and the audience was entertained by a broad range of artistic styles and musical genres from baroque to popular, ancient to modern. 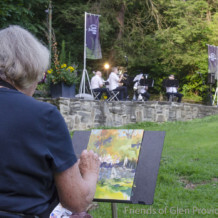 This third show in the four-concert series Arts in the Park presented by the Friends of Glen Providence Park was complimented by an exhibition of plein air painting by members of the Media Arts Council. 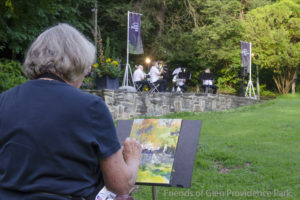 The real-time, on-canvas interpretations of these talented artists was the perfect companion piece for this multi-art community event that celebrated the season with the best that Glen Providence Park has to offer. Many thanks to all who made this concert possible: Delaware County Parks & Recreation, a grant from the Pennsylvania Council on the Arts, Concert Series Sponsor Media Recreation Board, Concert Sponsor Diego’s Cantina, our volunteer Concert Committee, Marcia Tate for her artful decoration of the stage, the hundreds of people who attended, and of course the Delco Symphony Brass Quintet!